We all spend time on Facebook and have likely come across Donatos Pizza at one point or another. Well, we wanted to meet the face behind the person in charge of their social media action. 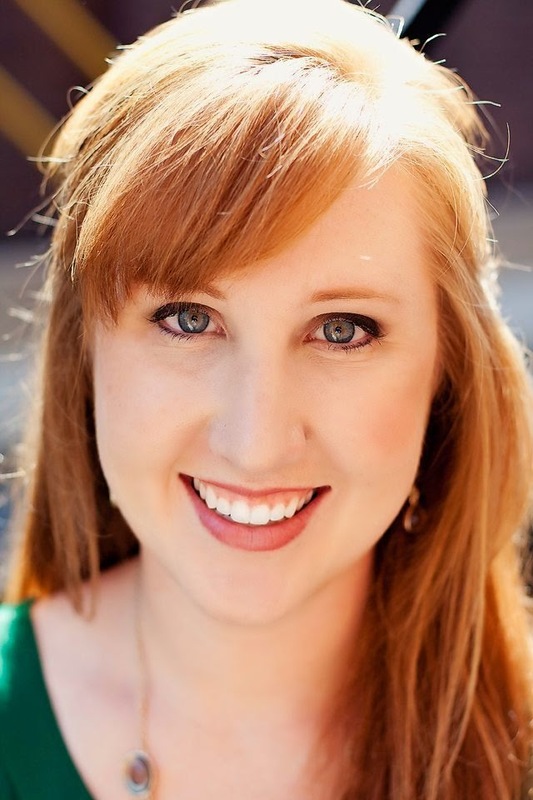 Meet Staci Hausch, the Digital Marketing Manager for Donatos Pizza. Staci answered a few questions about handling social media for a pizzeria with over 150 locations. PMQ: When did you start with Donatos? 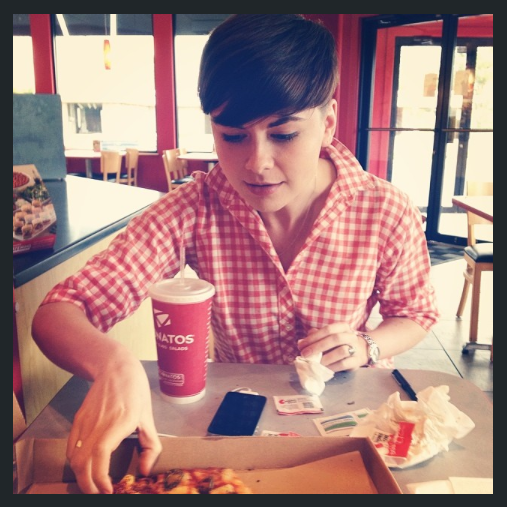 SH: I started with Donatos back in September 2013, just a few weeks before our episode of Undercover Boss aired! I’ve grown up on Donatos pizza, so when this opportunity came along, I couldn’t resist. It is an incredible family-owned company to work for. PMQ: Tell us a bit more about the company. SH: Donatos has been in business since 1963 when Jim Grote founded it (with only $1,300!). We’re headquartered in Columbus, Ohio and currently have more than 150 locations. Donatos is known for our famous thin crust, party-cut pizzas with toppings that span Edge-to-Edge®, and for our philosophy of promoting goodwill in all of the communities where we serve. PMQ: What is their onboarding program and how did that help you to do their social media? SH: Our onboarding program was incredible, because it included one-on-ones with everyone I would be directly working with, along with folks who I wouldn’t necessarily have direct communication with. Most of the people in our office have been working for Donatos for decades, and their knowledge of not only the history of Donatos, but also our products, was so helpful coming in. One of my colleagues in R&D, Donice, has been working with Donatos since the very beginning- for over 40 years! So, when it comes to social media, it was beneficial to be acclimated to so many facets of our business in an effort to keep our social content unique, and to appropriately share our company’s incredible story! PMQ: What exactly is your day made up of with Donatos? SH: Social media is only a small part of my role, so I get the chance to work on everything from our email marketing program, to the launch of our new responsive and adaptive website, to running contests and promotions on social media (like our Pizza for Life contest), to our mobile texting program, and more. One of the things that makes Donatos unique is how nimble our team is- I love that social media is a team effort, and that we get to see how it can affect stores across our system of franchise owners and company restaurants. PMQ: How much of your job is creating content and how much is wading through other's content? SH:For Donatos, it’s a beautiful combination of both. One of the best things about being in the pizza industry (and serving an incredible product) is that your customers are constantly taking gorgeous photos to share. We like to create our own content, and we’re always working to identify new ways to create our own content, but we do share quite a bit of what we find online. Nothing can beat an authentic experience that a customer had and shared with us, and it’s something we think is worth sharing as well. PMQ: What is social media to you? SH: Social media to me is how we’re communicating with a customers. Even in the short span I’ve been at Donatos, it’s been incredible to see the shift of guests reaching out to us online, especially as we continue to prompt it. Donatos has amazing brand ambassadors that we talk to daily through social media. For us, it’s an instant connection with those customers, and it’s a pulse on the in-store experience from far away at our Home Office. There was one fan who reached out to us a few months ago about her father that was very ill. He lived in Las Vegas, and one of his wishes when his daughter was planning to visit was to have a Big Don Sub, which is one of the menu items we’re known for. She had reached out to us through Facebook, and our Guest Relations team was able to coordinate shipping a fresh Big Don Sub to Las Vegas so her dad could enjoy it. He ended up passing away a few days after this, and the outpouring of responses we saw from his friends and family were incredible to see, and heartwarming to interact with. It’s amazing the power that social media holds in connecting people. Our COO, Tom Pendrey, is a believer in the term that it’s not B2B or B2C anymore- it’s H2H: Human to Human. Social media is the prime example of this. PMQ: What is unique to Donatos in terms of social media? SH: We like to seek out our Brand Ambassadors and reward them. We call it “Random Acts of Pizza.” I find such joy in seeing huge fans online posting photos of their pizzas, and then rewarding them with free pizza as a thank you for being a fan. Our company culture of promoting goodwill and making your day a little better is something that we strive to do on a daily basis. And, it’s just plain fun to make someone’s day who isn’t expecting it! PMQ: Do the operators handle their own social media in general? How does it work? 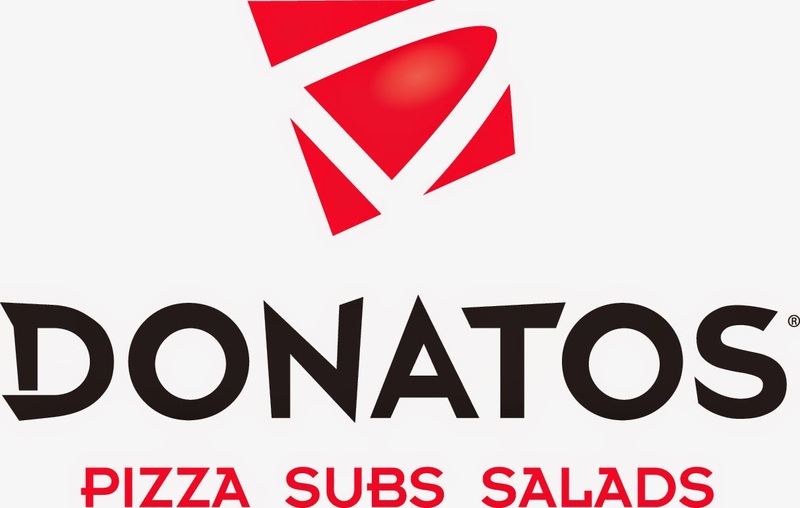 of Donatos as a brand. But, some of our operators have their own social media channels to allow for a localized voice to come through. PMQ: What do you have to do different on social media when you own more than one store but still have an overall brand message to get out there? SH: This is where social media tools are very important in helping to segment out your messaging. For us, we rely heavily on our partners in other markets to let us know what events are happening in their neighborhoods so we can share those stories when appropriate. PMQ: Do you find the social media needs to be different for different regions? SH: I do think it’s important to have a local voice that can speak to region-specific events, special deals, etc. 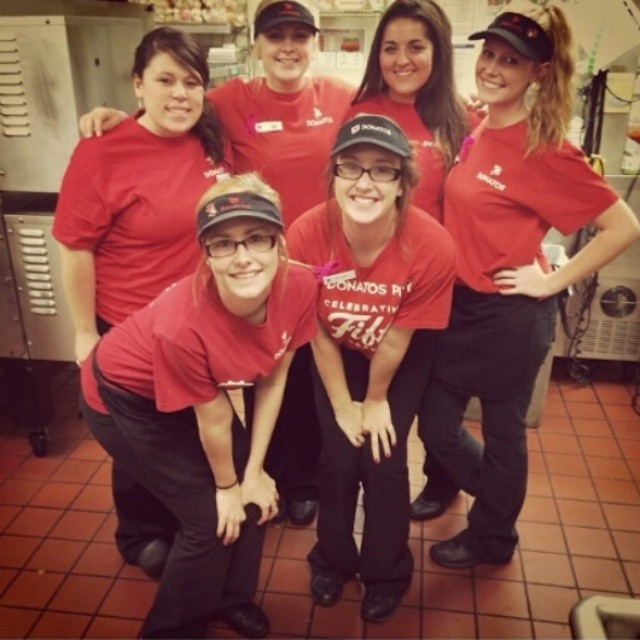 Our family of associates within each store is something that makes Donatos different in the pizza industry. These stories are ones that we like to share on localized pages. However, as a “brand voice,” this isn’t something that changes market to market. The Donatos voice stands true in every store we’re in, regardless of region. PMQ: What type of posts and frequency have you found to be the most effective? SH: We see the most engagement from posts speaking to our ingredients (people have very definitive favorites with our Signature Pizzas because we have so many unique combinations!) as well as posts that share customer stories. We also get to have a lot of fun with contests; currently, we’re giving away Donatos Pizza for Life to one lucky fan. In addition, we’re also giving away pizza for year to one customer from each of our stores! PMQ: What is your favorite social media personally and what works best for the brand? SH: Personally, I’m a raving fan of Instagram. As a brand, we’ve had such a strong community on Facebook for so many years that we absolutely love interacting with. However, we’re starting to see more value in Twitter and Instagram as direct and fast communication tools straight to our customers. And, being in the pizza industry, Instagram is the perfect showcase for our beautiful pizzas! PMQ: What is the key to success with social media for any pizzeria? SH: I don’t know that there’s a silver bullet; our efforts come from several directions on social media. That said, one of the most important things you can do on social media as a pizzeria is to share and create content that is as beautiful and mouthwatering as your food is. Donatos core principle is to “Serve the very best pizza, and to make your day a little better.” We embody this mission in everything we do, including social media, and our dedication to making every customer full and satisfied has been a huge factor of success for us. PMQ: Not every pizza shop can afford a PR firm or a social media full time person, so for those who are busy and can't hire this job out, what advice do you give them for social media if they just can't post daily? SH: Our advice is to work smart, not hard! Spend one day a month setting up posts throughout the week using tools like Hootsuite, and then as great stories pop up, share those on an individual basis. Set yourself up for success at the beginning of each month, and then you’ll be able to focus your time on operations and serving your customers. PMQ: We have found only about 50% of pizzerias have a presence on social media. What advice do you have for pizzerias in terms of social media? SH: Have fun with it, and don’t try to do everything on social media all at once. It’s also important to understand the different uses of social media. You’ll find that Facebook is becoming a great platform for communication with Boomers, but Twitter and Instagram are better with Millennials. If you’re just getting started, it’s critical to define your “voice” online, and then do your best to bring that voice to life on a few channels at a time. The principle of quality, not quantity rings true in social media. 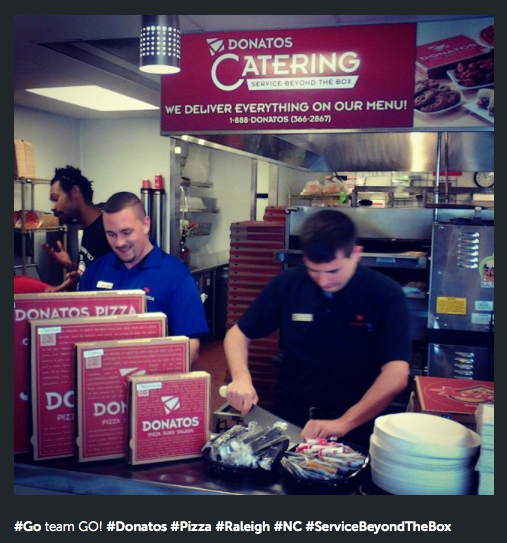 Learn more about Donatos social media by visiting Facebook, Twitter or Instagram.